iSize from 40 to 83cm, 0-13 Kg, birth to 15 months approx. Install with 3 point seat belt, or the optional iPlatform ISOFIX base in the car. The new KOOS iSIZE by Jané is the latest i-SIZE safety seat designed to protect your baby in the car. Suitable for children of up to 13 kg, and with a height of between 40 and 83cm which is from birth to 15 months approximately. This is an enhanced “i-SIZE” child restraint system. It has been approved under Regulation ECE R129/00 for use on “i-SIZE compatible” vehicle seats when used with the iPlatform base. The KOOS iSIZE child car seat can also be installed with ISOFIX (category D as indicated in the vehicle instruction manual) or with the car seat belt, universal classification. Depending on your car and personal needs, you can choose the best installation method that suits your situation. As the Koos iSize is also fitted with the PROFIX system, it means that it can be installed into the car or fitted onto the Jané chassis to make a travel system with just one easy click-and-go movement. Like the rest of the Jané range, the Jané KOOS iSIZE infant car seat is fitted with the PROFIX system (patented). 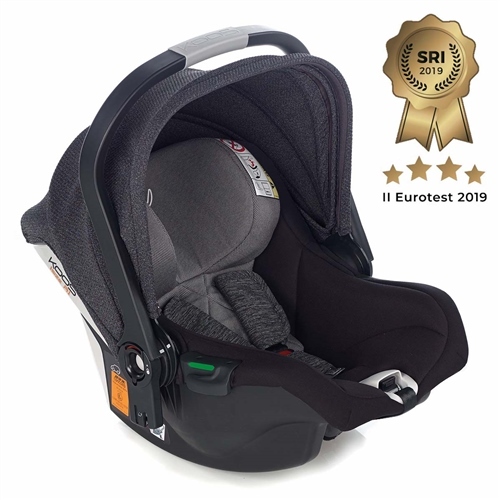 This means it can be connected quickly and safely with just one movement onto the ISOFIX base in the car or onto the pushchair chassis. With Jané everything is integrated into the system, so with the simple press of a button your travel system can be transformed. Koos iSize can also be installed using the iPlatform isofix base. Simultaneous safety harness and headrest adjustment. Complete with 40-60 cm cushion insert, for newborns. This Jané car seat meets and exceeds the iSize R129 Safety Standard.